We guarantee a ⭐️⭐️⭐️⭐️⭐️ stay and provide everything to do so! Please note that each booking is for a maximum of 6 persons. Infants and toddlers are welcomed in addition to the 6 at no extra charge. Super clean and pristine 3 Bedroom 4 bed 2 full bath home with new appliances in the 22’ ceiling spacious kitchen. 3 flat screen tv's, blue ray dvd, wireless internet and Apple TV included. 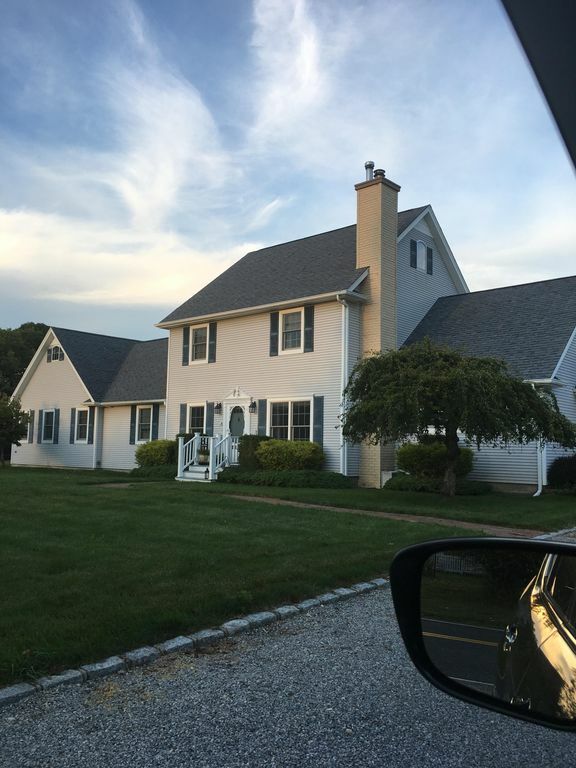 The home is situated in the quaint historic hamlet of Remsenburg, 5 minutes from Westhampton Beach Village, 10 minutes from the beach (Dune Road) and a bike ride to the bay. Speonk train station 1/2 mile away. Great local restaurants, pizza, bagels, Sushi and a liquor store minutes away. 15 minutes to the renowned north fork wineries and golf just minutes away. 15 minutes to Tanger Mall shopping and aquarium. 15 minutes to party boat fishing and great snapper and crab fishing just up the block. Come experience a Great summer retreat with fenced-in built-in heated pool (Child safe and Open May thru October) that features awesome lounges, floats and a fire pit all perfectly situated on a full acre of very private property. Lighted and screened in gazebo. Or perhaps you’d prefer a cozy home hanging around the wood stove sipping hot toddies during the winter nestled in one of the provided full body cozy blankets your ideal activity. It's an awesome retreat for whatever relaxing style you are looking for. We also have available, one high chair, one bassinet and one pack and play play pen. (Please bring linens for them). Wonderful playground just across the street with basketball court- ball provided. We are a very reasonable couple and will do our best to accommodate certain requests. You will not be disappointed. Total relaxation and total privacy is our goal for you and your guests. Plenty of beach chairs, umbrellas, small cooler and a beach cart are available for a great beach day. Unlimited wood for the wood stove and fire pit. 12 bottle wine chiller. 6 Bicycles with helmets. Very safe area for walking, jogging or bicycling. Our home by our standards and all 5 star reviews received, meets the pinnacle of coziness, cleanliness and privacy. Come experience true relaxation in the Iconic Renowned Hamptons. Hope you book with us! Sue an I have lived here for 22 years and love our home and wish to share our cozy home with you. We are more than happy to make your stay memorable and pleasant. We are located in an apartment on the property and will allow you your total privacy yet will be available for your needs on a moments notice which is a big plus. We chose Remsenburg due to its history, serenity and historic feeling. Our home is pristine in every way. My wife keeps it in pristine condition and everything is in in proper working order. The super spacious back yard is super private and quiet. You can chip golf balls or play catch with room to spare. I designed the heated pool to have a low end that young children can stand up in and the deep end is only 6 feet deep. No diving board or slide. There is a nice fire pit by the pool (logs included) and ample room everywhere on our property to make you feel totally relaxed. Great for star gazing. Our home has everything you'll need for a pleasant stay. Extremely quiet location. Huge backyard features maximum privacy. Close location to the renowned Westhampton Beach Village and white sand beaches of the Hamptons. Golf is 20 minutes or so just north of us. Local crabbing and snapper fishing right up the block. We have some tackle. We have his and her bicycles available by request free of charge. Great area for jogging or just strolling along safely. Awesome playground just across the street. Yes beach and pool towels too. 3 tv’s and Apple TV. Blue ray dvd. Built in that has shallow end suitable for small children. Pool is heated and is 6’ on deep end. Great backyard to chip balls, play catch and toss frisbees. Just as great in the fall as in the summer! We loved staying here over the summer and left obsessed with the pool, the property, and the Zurl family. We knew we would come back and re-booked almost immediately, but the second stay in cold and windy October was just as incredible as the first! Even though we were repeat guests (no need to impress us anymore!) there were still fresh roses in each room of the house. The attention to detail is so sweet, and unique to the owners. The kitchen was still stocked with essential spices and oils for cooking all our meals, and the bathrooms had plenty of plush towels just as before. We played cards and enjoyed some bottles of wine rather than hitting the pool like we did over the summer. Instead, this time around we used the grill and the cozy wood stove. The Zurl's even left firestarter! It was hard to get off the couch. We loved the gazebo even with the chill in the air and also went on a bike ride down to the bay. It was the perfect getaway from the city, with enough recreation and relaxation for all of us. THANK YOU to our second family for another great stay! We hope we can squeeze in a booking for Summer 2019 - seems like this is THE place to stay! If we could give over 5 stars, we would. Thanks Kat and friends or should we refer to you as our new Kids for your kind review! 😂. It’s always a great pleasure to have all of you stay at our home. You care for it as if it is your own and totally take advantage of all it has to offer. We are definitely looking forward to your return this summer and before you know it summer will be here. Please stay longer and get the full sense of cozy summer living here at what we will now call your Hamptons summer retreat. Love to all. Michael and Susan. Aka, Mom and Pops. As soon as you enter you feel like you are at your own home! The house is well appointed, nicely decorated, spotless, everything is just immaculate. As you walk around the house you cannot stop noticing the decor and the extent of detail that owners have put into it. The house is spacious and well equipped, I cannot think of anything that is missing. The grounds are spectacular, the pool is safeguarded making it very safe for kids. The fire pit was a nice bonus, the owner made sure there was log and a starter, our kids enjoyed making s'mores . The Gazebo on the backyard is charming, enclosed with screens to keep it bug free. The included grill was a big plus! Thanks Mike and Sue for a great weekend! Thank you Daniel and family for you kind review. We are very pleased you enjoyed your stay. Hope you come again. Regards, Michael and Susan. What a terrific experience! Michael was incredibly helpful, and always provided unsolicited advance notices to help remind us of key dates, necessities, and most importantly, to offer his family's warmest welcome. Cleanliness and comfort were our priorities when booking and we were not disappointed! The charming atmosphere of the neighborhood welcomes guests, and the tree-lined street was simply a haven for anyone seeking respite from more urban lifestyles. Michael provided all the information necessary to best utilize his home, kindly welcomed my son and parents earlier than anticipated, insisted on offering us comforts, such as heating up the pool in advance of our arrival (yes, it reaches 85 degrees, even when cool outside), and covered all the little things like identifying cabinet contents with tags, or conveniences, such as a pack and play for my infant. Not to mention, the beautiful home, the inviting furnishings, and the well-manicured property directly across the street from an elementary school that provided my son with hours of entertainment enjoying their very large playground. Even the few neighbors passing by were all incredibly friendly! For those concerned of a lack of proximity to activities, it's less than 20 minutes to the Riverhead area (outlet shopping, aquarium, water sports, vineyards, gourmet restaurants, etc. ), proximal to a number of golf courses, within 30 minutes of the sublime Parrish Art Museum and Sag Harbor, and minutes from beaches on either the bay or the ocean. All in all, it was a terrific experience with absolutely no problems, and I highly recommend that anyone seeking a retreat consider Michael's home and hospitality as the solution to your daily grind. Thank you Minsoo for your very detailed and kind review! We are so happy our cozy retreat exceeded your expectations. You and your lovely family are the ideal guests. It’s families like yours who make it a pleasure for Sue and I to want to share our oasis. We hope you come back and stay longer! Good health and happiness to all of you. Michael and Susan. Great house and location!! 100 percent recommend! We loved the house!! It was beautiful, clean, and had all the amenities a person could need. Location was great as well. Michael was a pleasure to work with. He was quick to answer any questions and help us with anything we needed. We would definitely rent this house again if we make another trip to Long Island! Thank you Ryan and family for staying with us. Please make it a plan to come back soon. Regards, Michael and Susan.
! ! ! Simply fabulous ! ! ! ! My family and I had the most wonderful time vacationing in this beautiful, happy home!!! We didn't want to leave! There were so many details inside and out - from gorgeous flowers, to supplies for the fire pit, to the most relaxing & comfortable sofas, lounge chairs and pool floats around - that made this a top notch and truly memorable vacation. In all of our years renting, we have never encountered more lovely people nor a warmer, more welcoming atmosphere than this. Sue and Mike, thank you soooo incredibly much. We can not wait to come back!!! A big happy “YAY” for that wonderful review! We are so happy that all of you enjoyed a super cozy and pleasant stay at our welcoming retreat in the Hamptons. My gosh the house was so clean that the cleaning girls thank you and your family for being so tidy. #us too! Sue and I are looking forward to your return next summer and before you know it you’ll be chillaxing pool side on one of the giant floats. Thank you again and again. All the best to our new friends. Hugs, Michael and Susan. Thank you Bash for your wonderful review. We are very happy that our home exceeded your expectations and that you and your family really enjoyed yourselves. We are already looking forward to your return next summer and as you know time fly’s. Thanks for taking exceptional care of our home. Cheers, Michael and Susan.